Only a little wish-list this week. I've spent so much time on ebay for little things lately but I've not really been able to have a proper search to see whats available. So for this week that's what I did. I've actually had my eyes on the makeup brushes lately both in store & ebay and I keep finding my way back to this set, with a set for only £10 and look how pretty they are. I've been wanting to purchase a few phone cases lately as I only own one & I also fell in love with the makeup bag, which is kind of a need as I need more space for my growing makeup collection. I adore sweet smelling candles & one that smells of Red Velvet sounds pretty amazing to me, hmm! And the final two pieces were the radio which is adorable and modern/vintage and the jacket is so cute and I love the colour. Anythibg on my wishlist you'd want to buy yourself? What products are you keeping an eye on eBay? Lovely little wish list! I love the 1D case haha. Such a lovely wish list, I adore sweet smelling candles too and that one sounds amazing! oh, i love all of these picks! 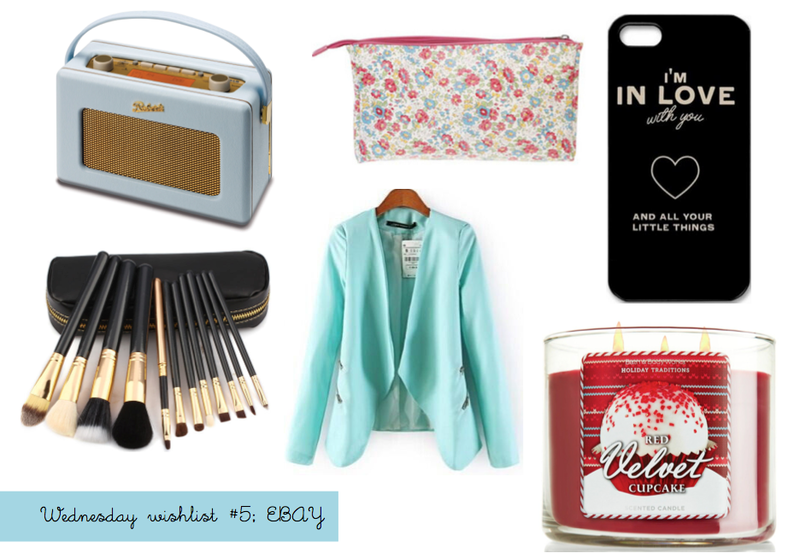 Such a lovely wishlist! I feel like I NEED that candle! That candle looks like heaven!! Oh I love a good ebay wishlist,there is so much amazing stuff on there!I've wanted one of those Roberts radios for so long,they're gorgeous! Thank you! I'm so tempted, so cute & simple! Oh that makes it so much more tempting to hear that! Oh so do I, I'm trying to resist the urge to have a look online to see what other amazing things they have. Aren't they cute! My first purchase of anything from this list will probably be the brushes! Isn't it the cutest, I want it so badly! Thank you :) I didn't realise how much I'd want one after seeing my friend with one and it's just so cute & such good sound quality too!